Sheen Common has 4 recently refurbished tennis courts adjacent to the sports pavilion. It is 5 minutes walk from the Sheen Gate of Richmond Park. We provide tennis to the local community of East Sheen and surrounding areas in Richmond. We help all ages and abilities find the right tennis pathway for them. We pride ourselves in the number of regular competing Junior players that we have, with a large proportion of those being girls. 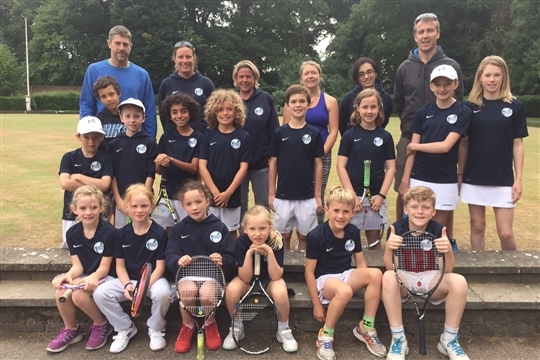 We regularly enter 8 Junior Aegon Teams and 4 Wilson Surrey League Adult Teams. We now have 200 children participating in tennis weekly on Sheen Common. We are trained and supported by Judy Murray's Miss-Hits initiative and She Rallies initiatives which, in partnership with the LTA, seek to promote tennis to girls.